There is something special about the field of architecture that intrigues us all. It’s a subject full of science and secrets. So much mathematical precision is required to build large, stable structures and yet that doesn’t seem to be enough. Architects are an imaginative bunch, finding unique ways to appeal to their client’s passions and to make a statement through the use of motif and architectural elements. One might find the vocabulary and physics boring, but the stories and secrets are just too good to pass up. 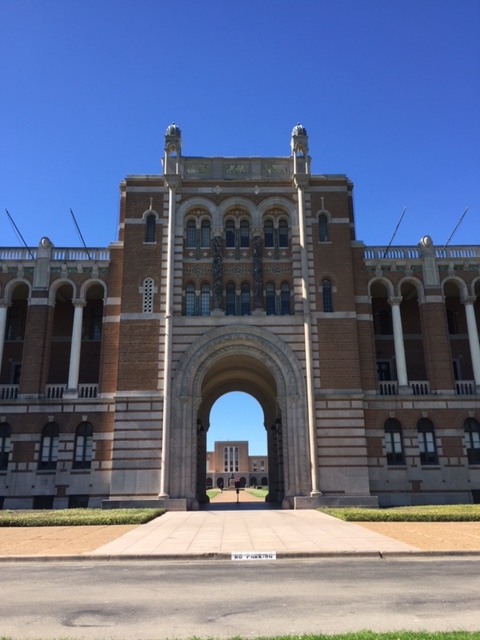 In honor of engineer’s week, we’ve decided to post our Rice University architecture scavenger hunt. It was designed as a creative way to get Xplorations campers interested in physics. To help you get around, you can find a Map of the University campus here. At the entrance to the University (Main at Sunset, Entrance 1) stand so that ‘Willy’s Statue’ is precisely framed in the center of the ‘Sallyport’ (entry arch to Lovett Hall’). This is a good example of AXIAL DESIGN ; things line up in a really cool way. “Sally port” entrance to Lovett Hall. In front of Lovett Hall, look at the two story balconies flanking the Sallyport arch—note the carved keystones in each arch. Enter the Sallyport, observe details such as carved stonework bands with birds, squirrels and leaves, carved heads, ceramic circles, etc. All carving in the stone bands was done in place! Take a right (walk North) along the CLOISTER (covered walkway attached to the building) toward the physics building (Herzstein Hall). The CAPITALS of the columns are carved with scenes of birds, student life and famous figures from sciences and other fields. Herzstein Hall entrance has two niches that create the ‘Whispering’ parabolic sound effect at the height of an adult keeling on the niche ‘shelf’. Whispering in the entrance to Herzstein Hall. A good way to let everyone know you’re definitely not a Rice student. Herzstein Hall has really neat turrets, under which is a series of ventilating shafts that previously served to release fumes from the chemistry labs below to be exhausted into the atmosphere! Lots of owls are carved everywhere on older campus buildings; try and find some! Look in corners of balconies, bands of stone carving, “face” of chemistry lecture hall, etc. 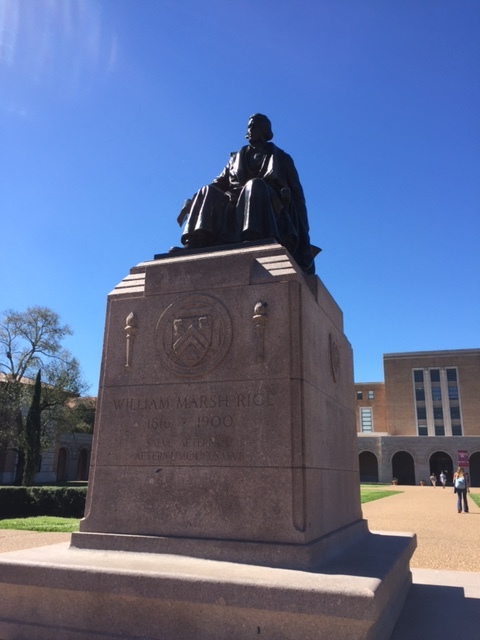 Statue/Tomb of William Marsh Rice. Anderson Hall—the architecture building. A really entertaining feature in the decorative freeze around the door on the quad nearest Willy’s statue: a series of holes that, when one runs his/her finger rapidly over the vertical row, makes a sound not unlike a “Bronx cheer”. Everyone should experience this at least once in their lives! Cut through the arched walkway to the road (loop road) in front of the Chemistry lecture hall (Keck Hall). 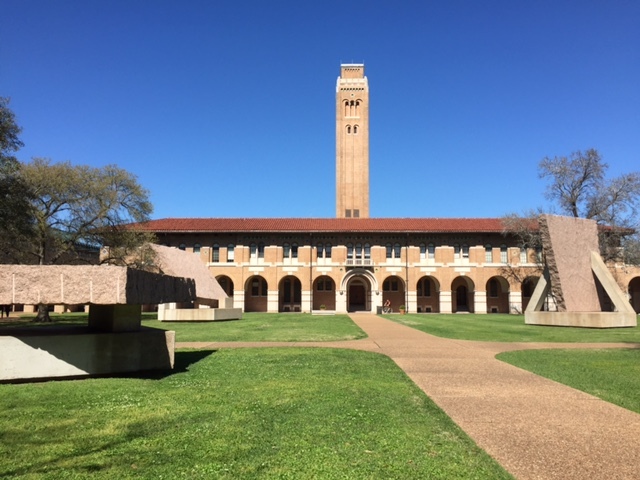 The features on the building are said to resemble Sammy the Owl (the Rice Mascot). Arched window eyes, staircase beak, etc. The really tall first step has been covered in part by a new step, making it easier to reach. In the early 1900’s, women were not only actively discouraged, from attending classes, they weren’t even allowed on campus after 6pm. The double height first step to the lecture hall doorway was a deliberate attempt to discourage women (in their long narrow skirts of the time) from going into the building. More circular ceramic tiles with chemical symbols. 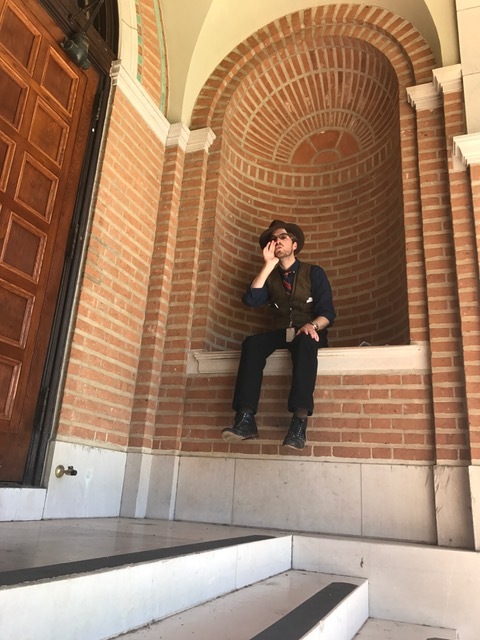 Additional from Corolyn L: stop by the George R. Brown Hall (Biochemistry) and check out the cool bricks/tiles in the open area. Natural Science buildings (Bio, Geo, old Space Science) have great decorative bricks with icons of each building’s science; Bio—moth, jellyfish, scorpion, squid, DNA, mitosis, glycine model, etc. Geo—fossil nautilus, leaves, trilobites, seismograph reading. Space—gravity apple, magnetic field, aurora borealis, atomic particles, comets, rockets antennae, etc. Head back toward the museum via the mechanical engineering quad. Note the ‘big rocks’ 45-90-180 for the degrees of elevation. These slabs of granite weigh so much, they each require a strong and deep foundation to spread the load. Otherwise, they would sink into the ground. It is okay to climb on the rocks, just BE CAREFUL. Campaniles are normally bell towers, but there is a campanile here used as an exhaust smoke stack (non-polluting). Duncan Hall—looks like a circus. Come in for an air-conditioned break and a look at the colors, shapes, textures and building elements. (Note by Carolyn L: Note the ceiling in the lobby—this mural was laser printed (!) onto fabric, then all the individual sheets were put together. Other buildings kids may have seen: columns on the Shepherd School (music school, gives concerts), Herring Hall with ‘argyle sock brickwork’ is the site for many plays. Previous Post Educator How To: Make Your Own Ancient Chinese Compass!